It seems like every videocamera nowadays is trying to emulate the success of the Flip Mino, and turn a teeny weeny handheld into a piece of high definition shooting action. Well this baby manages all that, plus more, and manages to provide you all this for a very attractive price. You get a 2.5 inch LCD screen which can rotate up to 270 degrees to make capturing that footage a doddle as well as a 5x digital zoom which can be used during recording. The camera includes Face detection software to make sure your subjects are always in focus, and EIS to combat those shaky hands. The camera supports flash memory of up to 8GB which should capture a reasonable amount of HD footage, and the settings can be turned down if you want to store more content. 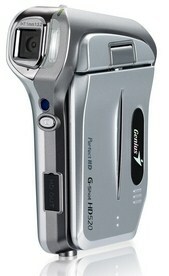 The G-Shot records in 720p, and outputs to a HDTV via the included HDMI port (cable included!). The G-Shot can also take images, and features a 5 megapixel camera with Z-lighting technology to enhance image brightness in low light conditions. It can actually take stills oat 11 megapixels if you use the integrated interpolation software and they’ve also included a voice recording facility so you can leave yourself memos.